This month’s designer spotlight is on Rebecca Cole of Rebecca Cole GROW. See how you can re-create her signature “modern organic” style for yourself. Rebecca Cole, former star of Discovery Channel’s ‘Surprise by Design’, has been taking over New York City and beyond for the past two decades with her company Rebecca Cole GROW. With her modern take on floral design, Rebecca’s work has taken her from creating star-studded events at locations like the Metropolitan Museum, Lincoln Center, and The James Hotel, to celebrity weddings and shows. 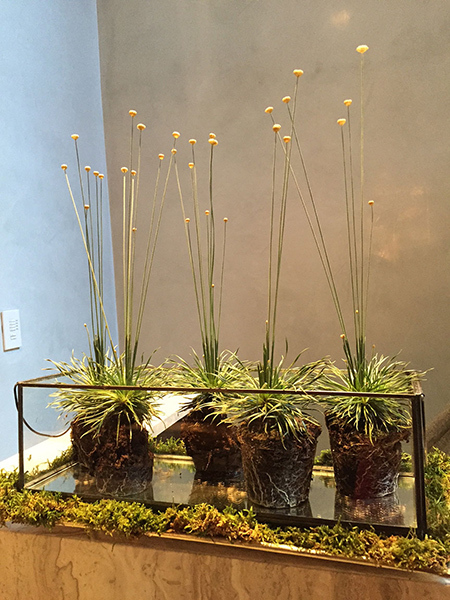 Rebecca has also been creating gardens, green roofs, terraces, and outdoor “living rooms,” making her one of New York’s top landscape designers. We sat down with Rebecca and got the lowdown on her top tips, tools, and tricks of the trade. Tricks for big style on a small budget? I try to find the coolest objects, vessels and plants, and then use them in the most surprising or simple ways I can find. My latest obsession is taking the soil off the roots of hardy perennials and exposing them in glass containers. Favorite design trend for 2015? Right now, I’m really into apothecary jars and natural nubby things mixed with simple florals. I’m loving that taupey-brown color right now in florals and accessories. 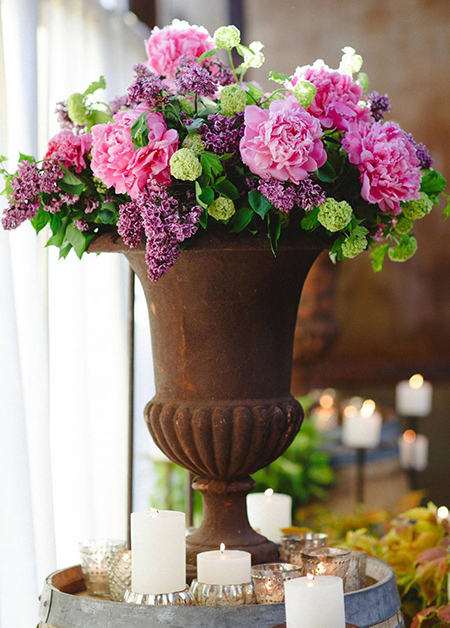 A rust brown urn filled with peonies, lilac, and viburnum, is surrounded by our mercury glass bowls and votives at this Brooklyn wedding Rebecca designed. Meeting Bono and President Clinton while they relaxed on my custom designed cement sofa in the Private VIP tent we designed for them at an event at Lincoln Center. Trade tools you can’t live without? The essentials. Clippers, a small knife, plenty of trash bags, and my iphone, are the items I always have to have when working. 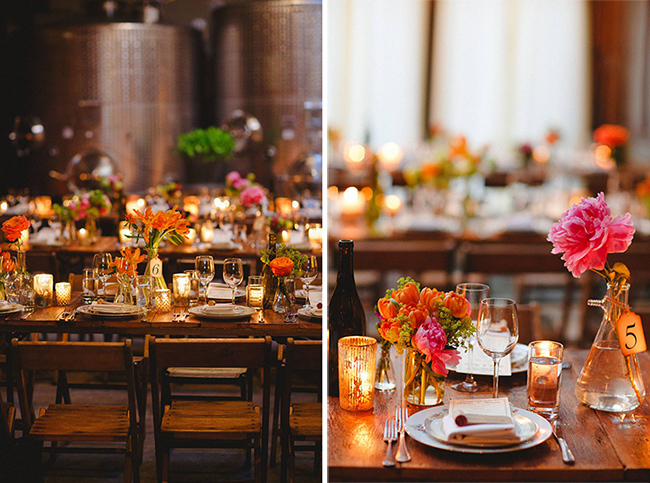 Our mercury votives added warm candlelight to the tables at the same Brooklyn wedding. A tip on how to make an event go from good to GREAT? Commit fully to your concept. Don’t water it down with doubt and people fearing it may be too much. Also, remember that simplicity can make something really stand out. It doesn’t have to be complicated to be fantastic! 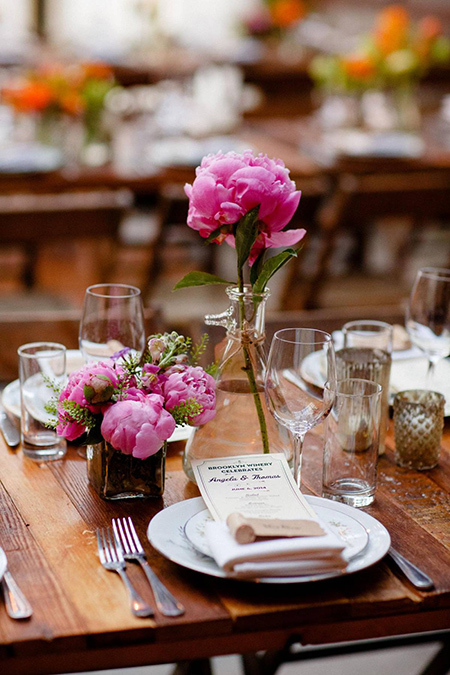 Here, Rebecca used our Antique Silver Cube for a shorter, smaller arrangement of pink peonies.